GERMAN LANGUAGE EDITION OUT NOW, see below. Telling the story of the formation of their classic line-up and the recording of their first album, the Deep Purple In Rock. An album which stayed in the UK album charts for over a year, was No. 1 in Germany for three months, and remains one of the most influential rock albums of all time. SECOND ENGLISH EDITION • This title sold out in just a couple of months when first printed in 2014 but at long last a second edition is in stock. The book is substantially the same but the opportunity to make some corrections to the text has taken. This title can be ordered through the Easy On The Eye online store. Twelve preview pages are on the site. GERMAN EDITION • This came out in November 2018 from Hannibal Books. It is substantially the same as the English edition in all respects, though some pictures have been moved around. It can be ordered on the Hannibal website now. This book opens with the dismissal of two of the original members and the search for replacements in 1969, then covers their early rehearsals, concerts and recording sessions in detail. The story carries on through 1970 as the band experience the early highs of widespread chart success with the album and hit single Black Night, as well as the lows of riots, illness and sheer exhaustion. 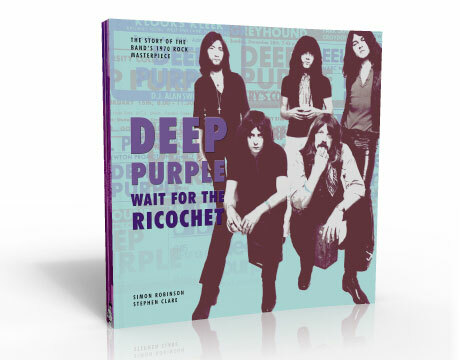 Bringing the strands of the story together for the first time along with unseen material, rare photographs, chart details, concert listings and new research, we provide a detailed narrative of this crucial phase of Deep Purple’s career. Jon Lord was interviewed specifically for the book (and the book is dedicated to Jon). Roger Glover has also provided new insights on the writing of the album and Ian Gillan offers a fresh look at Child In Time. Studio personnel, former managers and others have also contributed. Read an article about the design of the album cover on the sleeve art blog ST33. Authors: Simon Robinson / Stephen Clare. Simon has been a consultant on the release of Deep Purple archive material for EMI and other labels and has written extensively on the group over the years. His book on the story of one of America’s biggest one day rock festivals, The California Jam, was published in December 2012. Simon and Stephen are also working on a follow-up book about the story of the Machine Head album, due early in 2018. Price : £18.99. This title can be ordered through the Easy On The Eye online store. ISBN : 978-0-9561439-6-9. 168 pages, full colour, plus softback covers.